Can Lutz repeat his BMW marketing magic at GM? Lutz: Car guy or marketing man? Editor's note: Richard Johnson is the author of Six Men Who Built the Modern Auto Industry, published by Motorbooks International, which includes a section on the creation of BMW's image. With the shock still reverberating in auto advertising circles, the choice of Bob Lutz as General Motors Co.'s chief marketer has led to a fresh look at Lutz's credentials as an image-maker. Does the 77-year-old really have (or have left) what it takes to reinvigorate GM's damaged brands? Since July 10, when Lutz reversed plans to retire and took charge of GM's marketing and communications, there has been a new spin on Lutz's career. It turns out he was only masquerading as the ultimate car guy for the past few decades. He never had been an engineer or designer (which we all knew but seemingly forgot). He was really just a sales and marketing guy all along. "I had been practicing medicine without a license," Lutz joked recently. Automotive revisionism or true stuff? The word now is that Lutz played a central role in one of the most significant marketing transformations in auto history — at BMW. But did he really? Did Lutz help empower the BMW brand, or is it just an urban legend? He did indeed. Thirty-eight years ago Lutz launched the process that led to the creation of BMW's unassailable core brand strength. It doesn't mean he can do it again, but he did it once. What Lutz helped achieve at BMW — with many partners — is precisely what he is now trying to achieve at GM. That is, make design and driving sensibilities indistinguishable from the marketing message. In the 1970s, Bob Lutz and others transformed BMWs brand image. A 1975 BMW 3 series is pictured. In the summer of 1971, Eberhard von Kuenheim was busy mapping out the future of BMW. Newly installed, the 43-year-old CEO enticed a 39-year-old sales-and-marketing executive from General Motors' Adam Opel subsidiary to join him in the effort. That was Lutz, and together the two men took one of Europe's weakest car brand images and transformed it into one of the world's strongest. Once in Munich, Lutz quickly set about building an aura to fit the company's quick and agile sport sedans. Lutz also had control of the sales operation. In 1972 he and von Kuenheim decided to take back distribution rights from the company's national importers around the world. Perhaps his biggest assignment was to establish BMW in America, where the brand remained a mystery to lots of people. Inexplicably, a generation of Americans somehow thought BMW stood for "British Motor Works." Enthusiasts knew better, of course, but Lutz had to carve out name recognition for the rest of us. In 1974, he put BMW's U.S. advertising account up for review and ultimately chose the upstart firm of Ammirati & Puris over older and more established shops. Ralph Ammirati and Martin Puris had been copywriters at a hot shop called Carl Ally. Lutz had admired some clever Fiat ads that Carl Ally had done in the United States. The ads Ammirati & Puris came up with for BMW focused on driving sensation, handling and power. And Puris came up with the tag line "The Ultimate Driving Machine." BMW was now positioned to contrast itself with the mushy dynamics of most cars on American roads in the early 1970s. And it worked. When the first Ammirati & Puris ads broke in print and on TV in 1975, there were more 17- and 18-year-olds in America than anytime before or since. And those were highly impressionable TV-era teenagers being exposed to the early BMW advertising. What Lutz and Ammirati & Puris did in the mid-1970s was to help fuel the American baby boom lust not only for BMWs but for hip, high-quality goods of all kinds. Lots of those youngsters would grow up, become affluent and buy a Mercedes or an Audi or even a Saab. But BMW advertising helped form their impressions. In the 1980s, the age of yuppies, it wasn't only driving enthusiasts who bought BMWs; it was a new class of young professionals who a generation earlier would have bought Cadillacs. Lutz was gone by the time the ads began running in earnest, having left for Ford of Europe in 1974. But he was the father of a perfectly timed, massively influential advertising effort. "Yes, I did have a bit to do with it," Lutz says today. When he got to BMW, he says, the company "advertised little and didn't really nurture the brand." 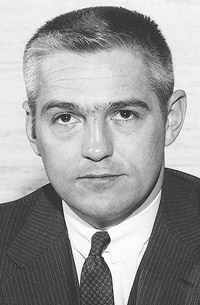 Lutz bought out the U.S. distributor, the legendary Max Hoffman, and hired a GM executive named John Plant to run BMW's North American operation. "He did an agency bake-off, and we selected A&P, and they, working with John, came up with 'Ultimate Driving Machine,'" Lutz says. "I believe I helped drive a strong brand focus when I was there." He also was able to prevent some brand-destructive disasters. When Lutz arrived on the scene, BMW had hired a consultant to change the company's airplane propellers emblem and "modernize" it. "I managed to talk von Kuenheim out of that," Lutz says. "Also, there were forces that wanted a more 'modern' horizontal grille theme and wanted to get rid of those old-fashioned kidneys. Many people didn't understand the role of BMW, and there was a lot of pressure from highest levels to be more like Mercedes — the noble, stately CEO's car. "It annoyed our CEO that, when he went to major CEO gatherings, everyone else had chauffeured Mercedes," Lutz recalls. "But that wasn't BMW. We wanted the younger, rising executive and professional who rejected the stuffy luxury symbols of the prewar and early postwar generation." Marketing historians indeed credit Lutz. "Ammirati & Puris in those days was a startup, just some ad guys and an ad director," says consultant Erich Joachimsthaler, founder of Vivaldi Partners in New York and author of Hidden in Plain Sight, a book about marketing and branding. "At that time General Motors was the monarchy. BMW had no street credibility in North America. They were the underdog, and then Lutz hired the underdog agency. "He needs to be credited for having the guts to take these Italians (Ammirati & Puris), who were not in the game in Madison Avenue," Joachimsthaler says. "It was his thing. He was in charge. And it wasn't just a tag line. 'The Ultimate Driving Machine' really mobilized the whole company." Joachimsthaler says the slogan rallied BMW and drove design and technology, influencing much more than just communication to consumers. But, he says, the big question is whether Lutz still thinks and acts like an upstart or now perceives himself as part of the automotive establishment. "When he was at BMW, he was the underdog looking up to the Big 3," Joachimsthaler says. "Now he is part of the monarchy. In history, it's not the monarchy that creates revolution; it's the people. And that was BMW at the time, the scrappy little company from Germany. BMW needed respect in America and 'Ultimate Driving Machine' was the channel. Now Lutz is part of the monarchy. I wonder if he can do the same thing."